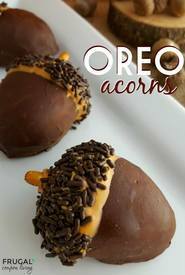 We think these OREO Acorns will be a hit with your family this Fall! Not only are they delicious but, they’re fun to make! The kids will love to help with every step of this recipe. Did you know that Oreos took their flavors to a whole new level and added peanut butter? YUM! They may look intricate to make but, in just a few simple steps you will have a bowl of OREO acorns to nibble on! I changed this up a bit and tempered some chocolate for dipping instead of the candiquik. I wanted the finest shine so I can serve these to my guests on T-day!